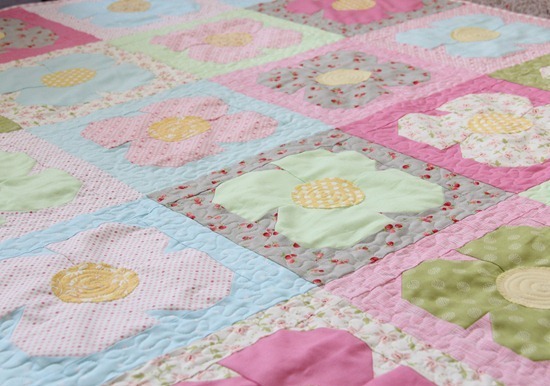 I’ve wanted to make a pieced flower quilt for a while now…so having a girl was the perfect excuse. The fabrics are from my stash…lots of different fabric lines and solids. The center circles are appliqued on to add some “round-ness”. After debating for way to long about how to quilt the flowers I decided to leave the petals un-quilted. They have a 3D effect that I love. My Mom has a flower quilt that was quilted this way and I’ve always loved it…so I copied. The circles each got a swirl in them with stippling all over the rest. Or at least she will….someday…crossing fingers. The pattern comes in 5 sizes and is available here as a PDF or hard copy. Lovely quilt!!! and baby of course :-) J.
Ha ha – that's a great picture of Sophie. Of course she will love the quilt. Heck, it's so sweet it even makes me want to have a girl. It's a beautiful quilt, and of course Sophie will love it!!! The baby quilt is darling. Love how you quilted. A very pretty soft colored quilt is really being enjoyed by baby. Super cute! If I have another girl, this just might be the quilt I make! 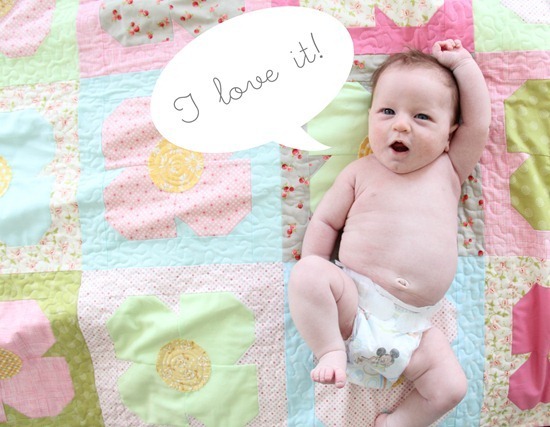 Love the quilt and your little one is adorable!! She sure is growing and just as cute as ever! Adorable quilt. What a fun way to use solids. This is beautiful, I love it so much! Love the soft sweet colors you chose for your sweet little one. What a beautiful baby she is! Congrats and Happy Mother's Day! 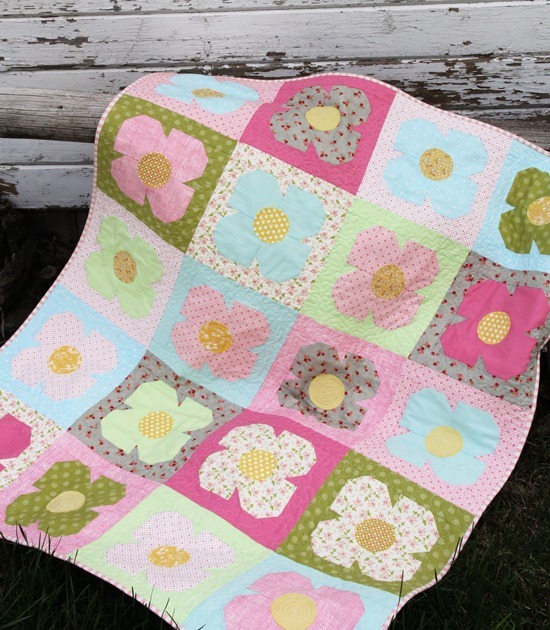 I love this quilt with all the pastel colors! She's so cute on it like She says "Rock on!" :) Such a nice idea to make the flowers this way. Oh, look at Sophie's little belly ~ so very sweet and on the quilt, even cuter! Oh Allison, Just when I promise myself not to buy another quilt pattern until I've made at least one quilt with the ones I've already bought…you come up with some darn cute thing that I HAVE to have. Super cute. Oh geez! I am dying over that bottom picture! It's like she is saying "yeah! my mom made me an awesome quilt!". Oh, and I LOVE the quilt too! That is the cutest baby ever! Uggg…makes me want another grandbaby so bad! She is ADORABLE! Oh my, what a pretty baby! Ha ha ha, adorable!! That is one very cute baby on a very cute quilt! Priceless! I love the quilt, and the baby is adorable too. i love it too. very nice. 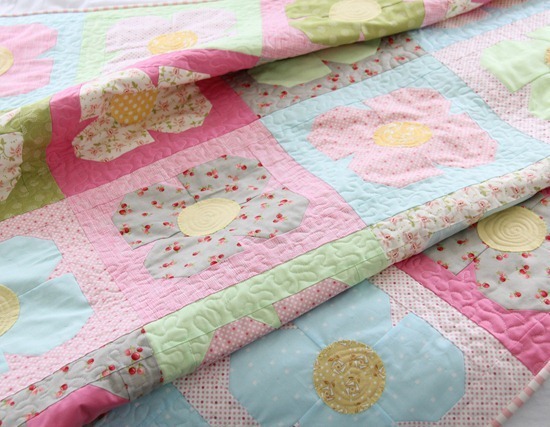 This is a very cute little girl quilt…I just might have to make one! And I can't believe that Sophie is already talking! She is amazing! I love it! Order it! But I think that Sophie (baby) is most precious! Love it and Sophie is beautiful hope she will have your love of fabric and quilting. Sophie is a Sweetie Pie!!!!!! So cute!! LOVE the quilt, will try my hansd at it! Enjoy Quilt Market! I got my pattern the other day, I was shocked, it arrived so quickly. Thank you! Good luck at Market! That's a sweet quilt. Just made for a girl.